Happy New Year to any that I may have missed. If you read my earlier knitting post you’ll know I had a wonderfully quiet and simple Christmas and if not..well you know now how my Xmas went lol. The start to my New Year unfortunately could not be said. Grab a cup of your favourite beverage and settle in for the catch up ! New Years Day dawned bright and sunny and we were off to my Mum and Dad’s for lunch but that soon turned into a trip to the out of hours doctors and then onto A & E for my Mum who suddenly felt unwell. Thankfully after a 6 hour wait we were seen by the dr who was happy enough for me to take her home. It seems its part of the terrible flu she has picked up so she is back to her own doctor for the third time with it. 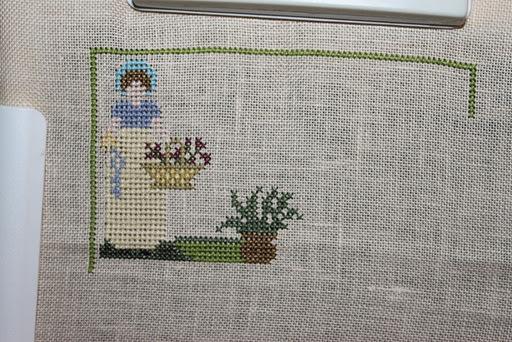 I left you all before Xmas with the Nursery Rhyme series being stitched for the younger children, well I got the two boys finished and framed and although I got Elizabeth’s started before Xmas I was unable to finish it in time for it to go under the tree, I was able to pick her up something to unwrap on Xmas so I suppose she got the best of both as her picture is now complete lol. Here are the pieces finished and framed. 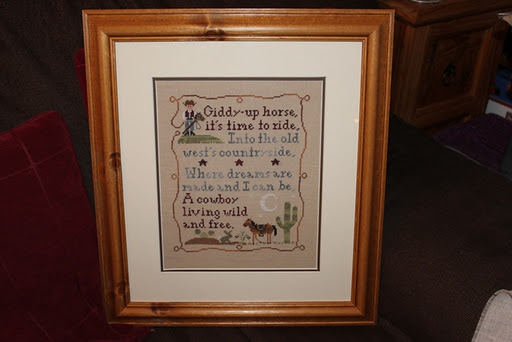 Yesterday was Benjamin’s 3rd Birthday so I started CCN’s Cowboy Dreams for him for his birthday on St. Stephens Day and finished and framed it the Friday before New Years (when I stay off the computer its amazing how much I get done! lol)…. As you all know I’m doing the CJC 2012 and so had to start my 15 starts well as you can imagine with the drama of New Years Day and I didn’t get home from the hospital with my mum till near 2am there was no starting anything for me on Jan 1st so yesterday I had a catch up with two projects…they were only very small starts but I figured at least now I’m up to date and can carry on now, plus the project I had planned for Jan 1st is one I’m coming back to after the first 15 days…. 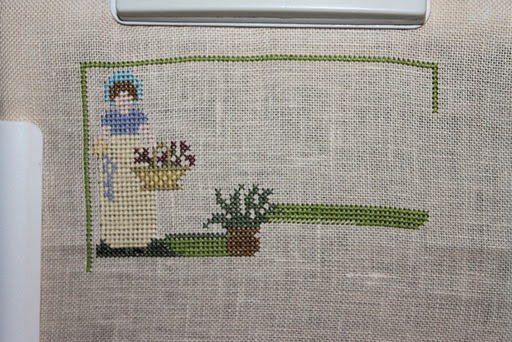 I have no particular rotation as to what I stitch in my crazy challenge, I’m just going to my box that holds the folders and choosing what takes my fancy, for these first 15 days that’s what will work best for me, afterwards the projects will need to be done according as the birthdays come up as the challenge is full of birthday pieces. I will be back daily to update on the rest of the challenge pieces, there will also be an update for my reading challenge of reading 40 books this year, I’m starting with a book recommended by my friend Vickie. I also will be back with my personal challenge of knitting a dishcloth a week and will have an update on that with a pattern link for anyone who’s interested. 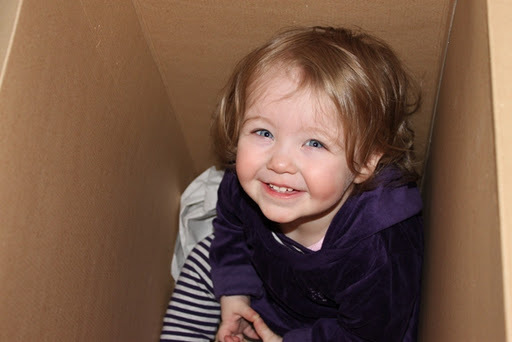 I leave you now with a picture of my baby Elizabeth, she got a kitchen from Santa which she is getting great enjoyment out of but she also got great enjoyment out of the box…. take a look and see 🙂 If you have reached this far thank you so much for sticking to the end of what was a long post. 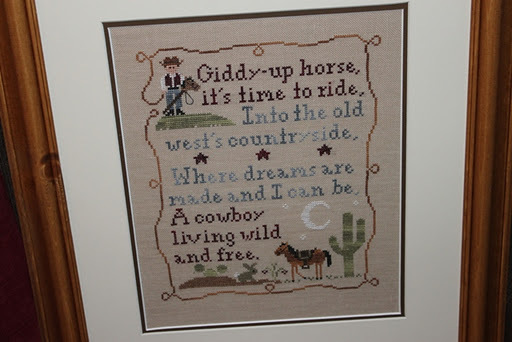 This entry was posted in Uncategorized and tagged CCN, Cowboy Dreams, English Garden, Jack and Jill, Little Boy Blue, Little Miss Muffet, Mrs Darcy Sampler., Nursery Rhymes. Bookmark the permalink. What darling babies you have :)Both are just sweet little cherubs!I love the nursery rhymes and the Cowboy dreams is darling too! What lovely little ones you have. 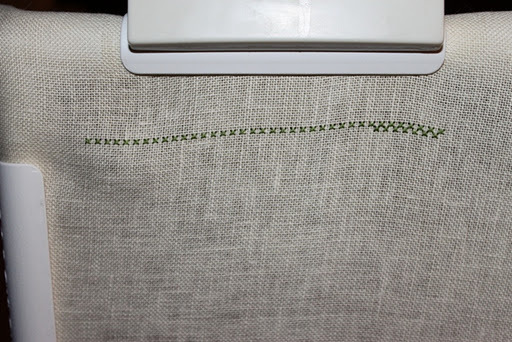 Not sure how you can find time to stitch with small children but the starts are looking nice. Oh Ruth, Elizabeth is just gorgeous! How she has grown :)Sorry to hear about your Mom – I admit that when you first mentioned A&E I didn't understand what it was – reading your post now I understand! I do hope she's feeling better!Benjamin looks right chuffed with his cake! Did he help bake it :)And your Nursery rhymes are lovely! 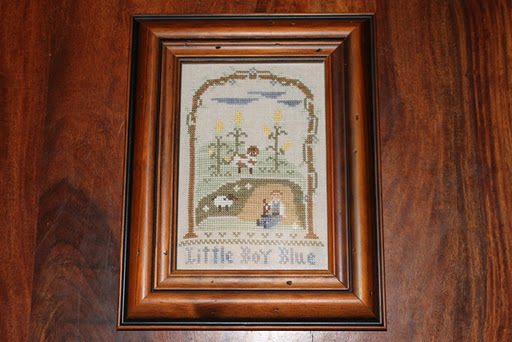 I have Boy Blue too – seeing it all done up makes me think that maybe I should add it to my crazies :)Looking forward to watching your starts (which already look good) grow! What alot you haven done! Don't know how you get so much done with the little ones there! Who are very sweet by the way! They look like they keep you hopping! Can't wait to see more of your Crazies!Melissa J.
Hugs to your Mum, hope things are improving. 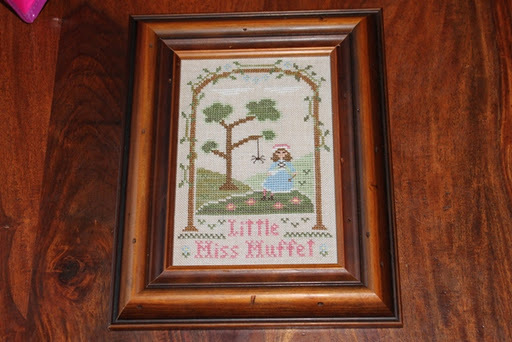 Love the Nursery Rhymes. Amazing how we buy these gifts and they like the box just as well! I am so glad that I came across you blog. I am looking forward to following your posts. 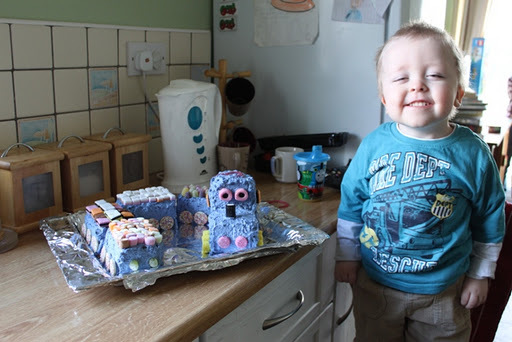 I remember making a Thomas The Tank cake for my son many moons ago. 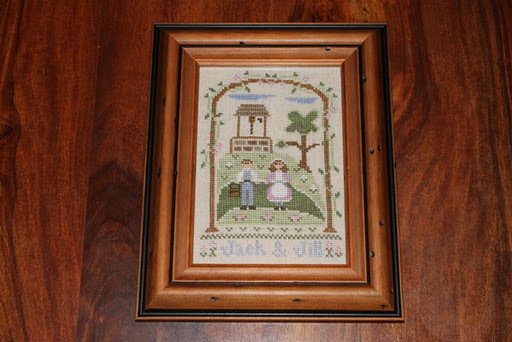 Yours is much better than mine.Your needlework is beautiful. 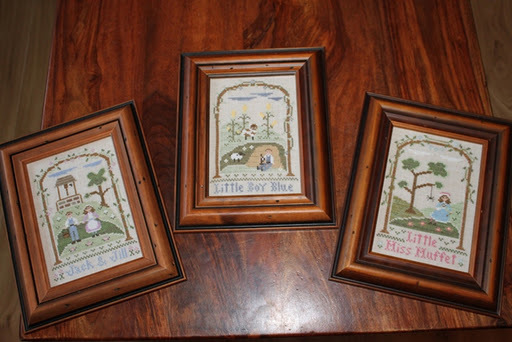 Ruth, your nursery rhyme series turned out lovely for the kids. They may be small starts but they are starts none the less! Beautiful babies you have, Ruth. Love their pictures. 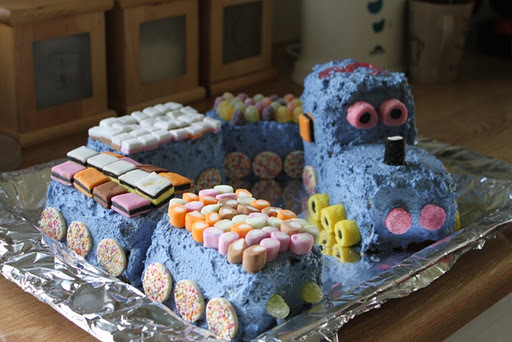 Super design of Thomas Tank Engine Cake…Love the framing & your finishes. You have been one very busy girl!